Spring break is fast-approaching and you may want to brave Disney, hit the beaches, or fly to see family. If you are considering taking a plane with your child with special needs, but are fearful of how they will do, here are some tips that may make the trip a little easier. Bring their favorites: You are about to be locked into a seat for a while, and this is the time to bring out the big rewards. Reduce access to some preferred items before the trip, with the hope that when you embark on your journey, that favorite toy will keep your child occupied and happy. Call ahead: Carriers and airports may be accommodating to your child’s special needs, including seat selection, boarding times, and even transportation around the airport, so just ask. The in-flight team may also be able to help ease your time on the plan by bringing extra snacks or providing more frequent check-ins. The TSA Cares program can be a helpful resource. Plan for the difficult times: What is the most likely challenge your child will face? Bathroom access? Lack of movement? Noise sensitivity? Food restrictions? Consider the possible scenarios and make a plan for it. This may reduce your stress and help you prevent or respond to challenge. Consider shorter flights with breaks if your child is unlikely to sit for long periods of time: This may help to build natural movement breaks for them and provide an opportunity to sneak away to a quiet corner if needed. Alternatively, consider direct flights if the chaos of boarding will be the key challenge. 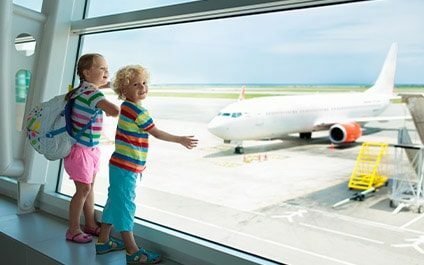 Children of all needs and ages often have more eyes on their behavior on an airplane: If you anticipate that the flight might be difficult, prepare for how you will react. Some parents may consider letting nearby passengers know what would be helpful to their child on the flight. Other parents may want to be more private and hope for the best. Either way, prepare a plan to keep yourself calm and anticipate how you will not only react to your child, but to other passengers as well. Practice, Practice, Practice: It may be helpful to communicate with your child about what a plane trip is like. Practice the expected behaviors. Use rules or picture prompts that may help to promote success when the real trip occurs. Good luck on your flight! Safe travels!